It's that time of year again where our good mates over at clothing companies are exceptionally generous and send us some sweet bits from their latest collections. It's November now and unfortunately the weather is starting to deteriorate so brands are turning their attentions to Autumn Winter and all the wonderful clobber that comes with these dreary seasons. Since around 2009 I've been a fan of Art Gallery Clothing, their knitwear is the epitome of modernism and takes inspiration from the past whilst still remaining modern and relevant in today's market. AGC have grown since 1996 into one of the most prominent, forward thinking brands on the scene today. Season after season they continue to push boundaries, colour pallets and styles. Unlike several brands who were regarded as 'mod', as the years have passed AGC have always been that brand that even appeals to the non-modernist man on the highstreet. I guess what I'm trying to say is they create wardrobe essentials for the men and women about town. Anyway let's get down to talking about the threads we've been sent from the AW18 range. Now this is totally stunning. 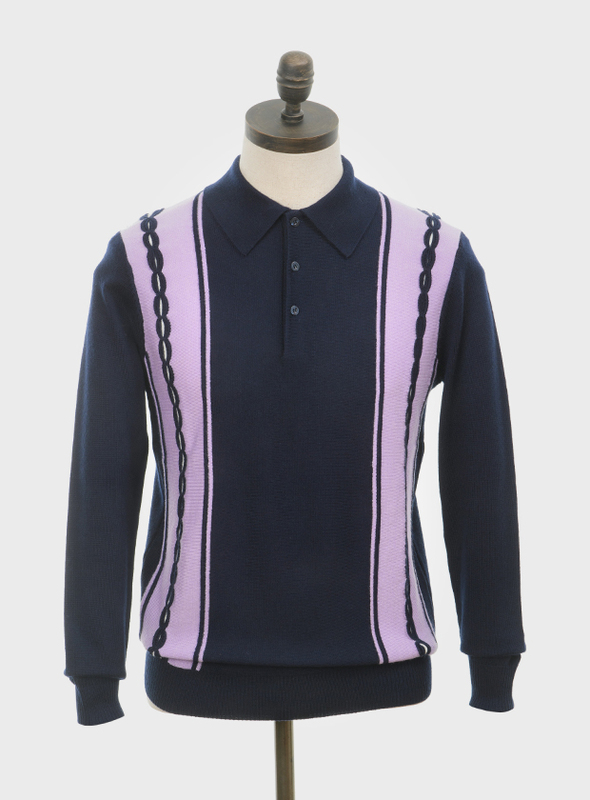 AGC have produced some beautiful knitwear over the years but 'Holmes' is one of the best looking pieces I've seen all year. 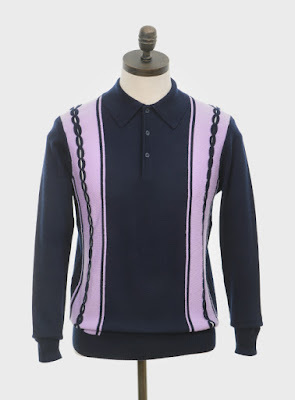 This version comes in navy with lilac tonal stripe detailing and offers the wearer the crown of coolest cat in the club. It's simple but very, very effective and looks superb on. Of course with AGC stuff there are tons of great little details too. For example in the middle of the lilac stripes there's a line of cable knit which features flashes of white inside it, ace. Then there's the three button placket with soft cutaway collar. All of the buttons are branded and there's the all important neck fastening button which gives it that extra neatness when being worn. Made from 100% merino wool the quality of this piece is outstanding and keeps the cold out on these wintery days, whilst providing the wearer with a sleek, slim look which has onlookers staring with envy. 'Holmes' takes huge inspiration from the kind of knitwear being worn at Ham Yard and The Flamingo whilst putting its own 2018 touch on the piece which keeps it fresh and relevant. The whole navy and lilac mix is seriously eye catching and has turned a few heads when teamed with a lilac sock on the dancefloors of many a club in the north, believe me... The merino wool used is of a perfect thickness and is neither too thin or too thick so this piece can make the seasonal transitions you know you'll want it to. Overall, it's easily one of the best items AGC have ever designed and is sure to be an iconic piece for years to come with people who missed the boat begging for a re-release on social media. 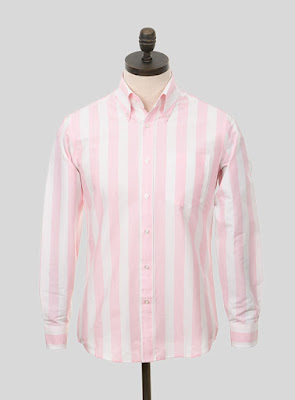 Candy stripes, button down collar, box pleat, hanger loop, you know the dance here. It's another beauty of a BD from AGC. Art Gallery have upped their shirt game in recent years and are continually producing classic, well designed pieces season upon season. A candy striped button down has always been a Modernist classic veering away from the much loved gingham check which we've seen done time over. 'Sinclair' provides the wearer with that 'eurocentric' look which has been adorned by many a sussed Modernist over the years. This one comes in a cool baby pink and white candy stripe which looks great on its own and with plain knitwear when the colder months set in. I wear mine tucked in (of course) with either jeans or strides then teamed with some GH Bass Loafers or a trusty pair of Clarks Originals or even some Novesta Starmaster, the options are endless really! The fit on the 'Sinclair' is great and provides the wearer with that sleek look that all Modernists dream of. Shirts are hard to get right but it's safe to say that AGC get this one spot on and this is an area of the brand that I feel with continue to go from strength to strength over the coming seasons. There you have it, two superb pieces which you can shop here!